When the Corps was activated as part of Company H in 1960, Buck Soistman made a set of twenty-two traditional wooden rope-tension drums for it. 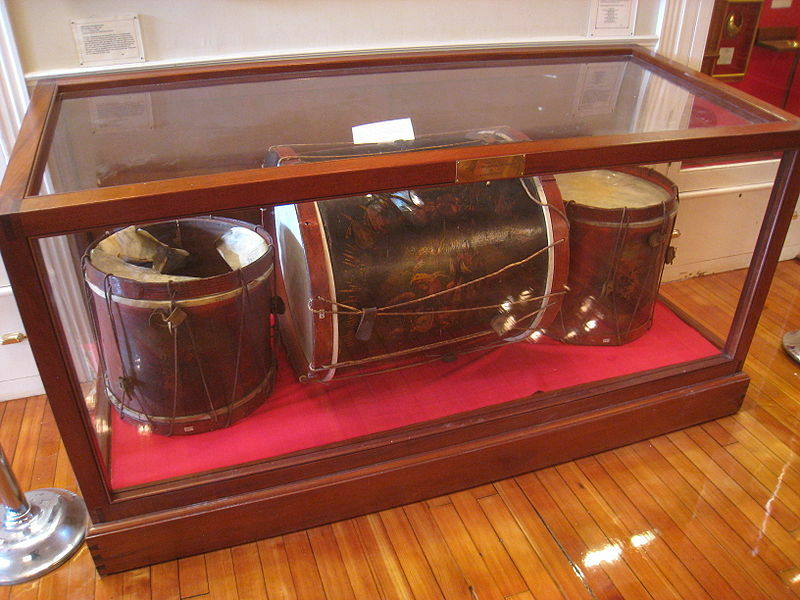 The drums were in regular use until they were retired to the Old Guard Museum in 1989. 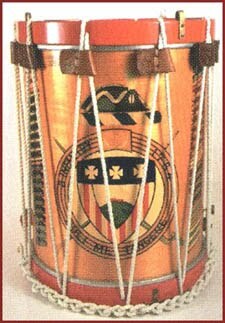 Each drum is hand painted with the arms of the regiment and battle honors. Source: The Old Guard Museum website. 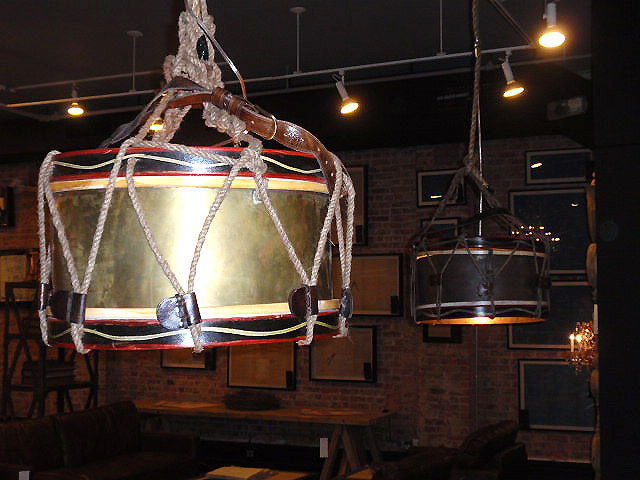 Here's a creative (or sacrilegious) use of antique rope drums by Hudson Goods. Visit our on-line store at HudsonGoods.com. 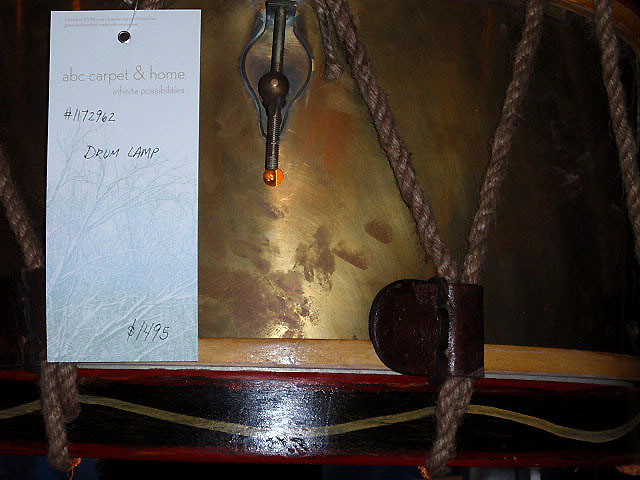 Who would have thought that you could turn a drum into an end table or even a hanging lamp? Well, now you can. These drums come in bright decorative colors with real leather straps and thick rope. 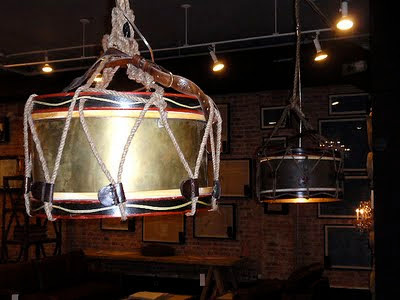 So if you are musically inclined or always wanted to be in a marching band, check out these cool drums that are now being used for home furnishings. These drums can be stacked in a corner, used as an end table by the sofa or even hung over the table for drum light dining. So go ahead and march to the beat of a different drummer! Civil War regimental drum, 13" high by 14.5" in diameter. 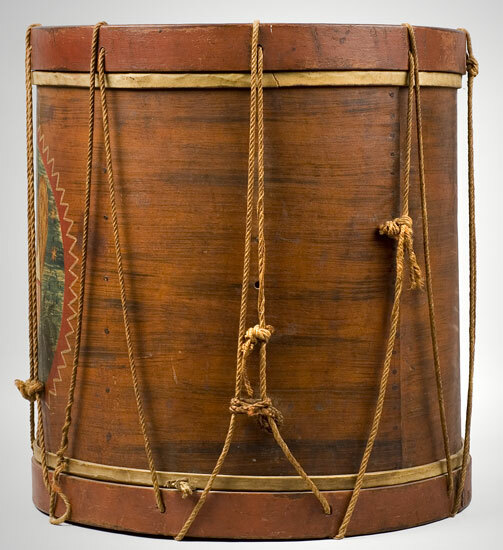 Inside label reads: Drums of all descriptions made and kept constantly on hand, for sale by William Mixer, Orleans, Jefferson County, N.Y. 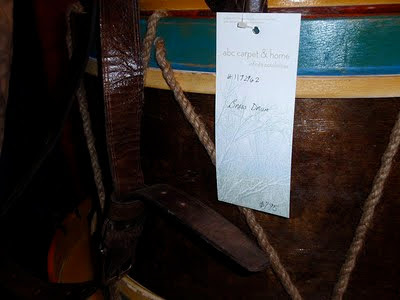 Drum is rope tensioned with leather keepers. Wood has a pleasing reddish tone. 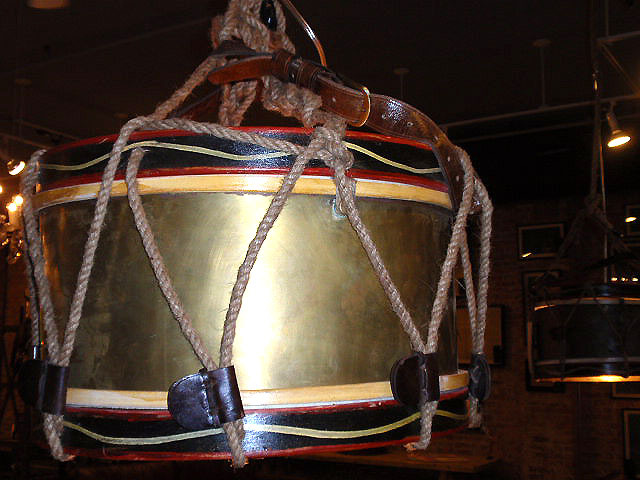 The top of the drum was signed by members of the regiment. Most of the penciled signatures are faint but legible. A unique bit of history. 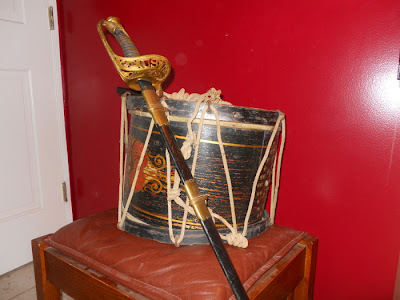 14.5"W x 13"H.
Civil War Style Marching Snare Drum, matching Leather Drum Sling and antique Rosewood drumsticks. 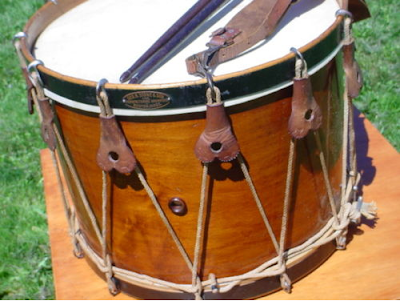 Gut Snares. Original hemp rope. The drum heads are definitely 17" measuring across the heads from inside the rim. 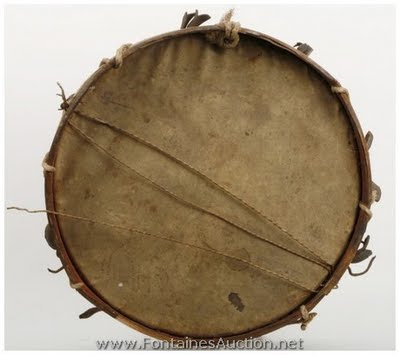 The drum appears to be 100% original. Gorgeous condition; the drum has a maple drum shell measuring 17” diameter by 12” deep, with original lacquered finish. 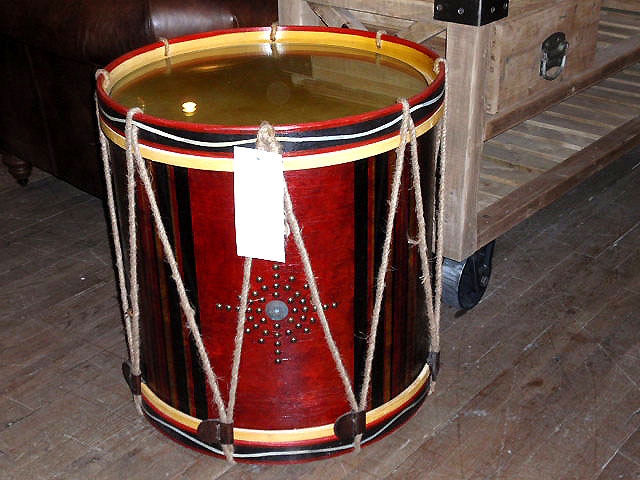 Drum hoops maple are painted black on the outside and natural stain on the inside. The famous George B. 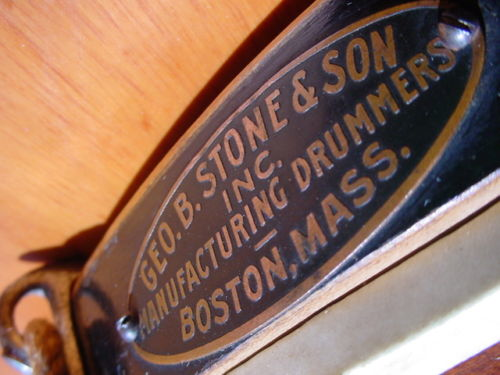 Stone and Son, Manufacturing Drummers, Boston Mass. metal badge affixed. Hardware appears to be nickel plated; drum heads are in very good condition, drum plays amazing crisp and loud. Beatiful Rosewood drumsticks are antique, measuring 17-1/8" inches long. 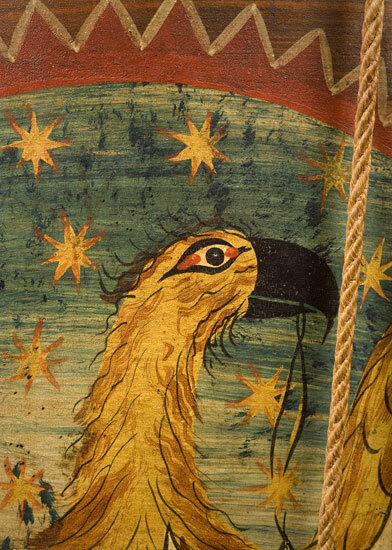 From website of Antique Associates of West Townsend, Inc. 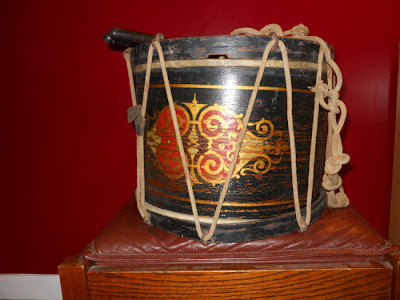 This civil war drum was carried by my great, great grandfather Charles T. Russell from 1861 through 1865. He enlisted in the Maryland Fifth Volunteer infantry with his father Walter Russell. 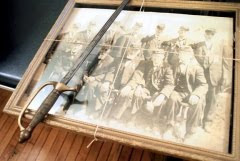 Walter Russell rose to the rank of Sergeant Major and carried the sword pictured below. The 5th Md. Infantry was organized in Baltimore in September, 1861 for three years of service. Co. A. was recruited from North East, in Cecil County, while Co. I. was recruited in Elkton, Cecil County. Co. E. was recruited in Frederick County and Baltimore City. Companies B, C, D, F, G, H & K were all recruited in Baltimore. The regiment trained at Layfayette Square in Baltimore until March of 1862, then proceeded to Fortress Monroe, where it was assigned to General Dix's command. Soon after the 5th's arrival in Virginia, the Union war effort shifted from the penninsula to Northern Virginia. Assigned to 3rd Brigade, 3rd Division, 2nd Corps, the 5th Md. marched back north into Maryland with the Army of the Potomac to fend off Lee's invasion of Maryland. On September 17th, the 5th participated in the bloodiest day of warfare in American history, the Battle of Antietam. The regiment was involved in the gallant contest both sides made over the sunken road, that has become known as "Bloody Lane." The 5th suffered 39 dead, 100 wounded during the contest, as well as two commanding officers in one day. After the Battle of Antietam the 5th was assigned to General Milroy's command in the Shenandoah, and remained there until June of 1863. The regiment was at Winchester in June of 1863 when that city was besieged by the entire 2nd Corps of the Army of Northern Virginia, as it advanced toward Maryland. The 5th Md. was among the units which managed to cut it's way through Confederate lines at a high cost in dead and wounded. The regiment was so badly beaten up at Winchester, it was forced to return to Baltimore to recruit and refit, not rejoining the Army of the Potomac until early 1864. Of those new recruits, nearly 100 men deserted immedately after receiving their enlistment bounty. The 5th rejoined the Army of the Potomac in time to particpate in the siege of Petersburg, June to September, 1864; Battle of the Crater, July 30th 1864; Siege of Richmond, October, 1864 to April 1865; the Second Battle of Fair Oaks, October 27th, 1864; and the occupation of Richmond, April, 1865. Regiment lost during service 1 Officer and 63 Enlisted men killed and mortally wounded and 6 Officers and 91 Enlisted men by disease. Total 161. Pre-Civil war American militia drum, ca 1812-1848 (war of 1812-Mexican war era) with a fantastic stylized folk-style eagle in a red, white, and blue medallion with a black and gold swag border. The body of the drum is red and mustard, sponge-decorated over an earlier Prussian blue. The entire surface of the drum is paint-decorated, which is a substantial plus over other drums where only a panel is painted. Under this second surface there is evidence of an earlier medallion. The current surface, however, is both exceptional and early, probably repainted for Mexican War (1846-48) or Civil War (1861-65) use. 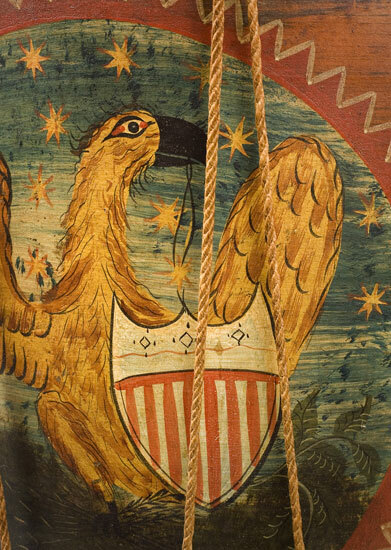 The eagle is one of the best I’ve ever seen on a drum in terms of an early folk interpretation, with a huge eye of exaggerated size, red feathers on a gold ground, a whimsical shield, and eight-pointed stars behind it in the blue sphere. Condition: Replaced skins, ropes and ears, all of which are expected and acceptable on early drums. From website of V and M Curate Your Life. 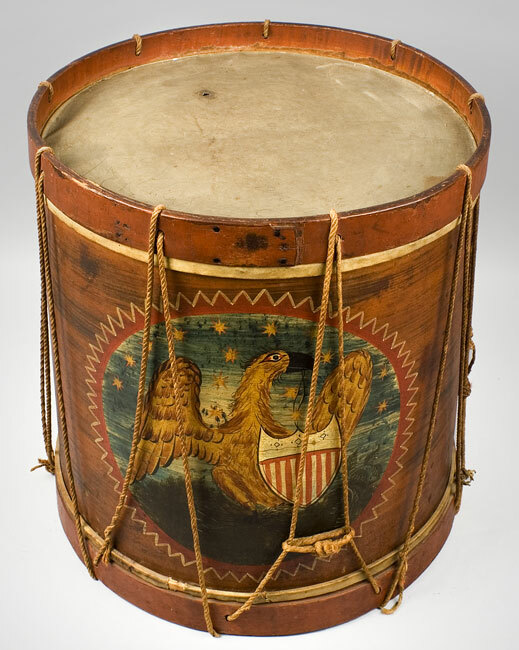 Drum from the American Civil War, exhibited in the Soldiers and Sailors National Military Museum and Memorial, Pittsburgh, Pennsylvania G.
Included photo titled, "Robert Y. Thompson in G.A.R. Uniform, Musician, Co. D. 61st PA. 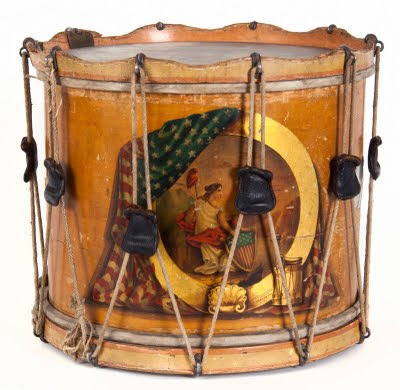 Drum belonging to Bugler George H. Love, Battery A, 212th Regiment., 6th Artillery (note the red color characteristic of artillery drums). Presented to Memorial Hall by Mrs. William W. Lehman. Drums in the Museum of the Ancient and Honorable Artillery Company of Massachusetts, located in Faneuil Hall, Boston, Massachusetts, USA. Two side drums from 1799 and a bass drum from 1803. 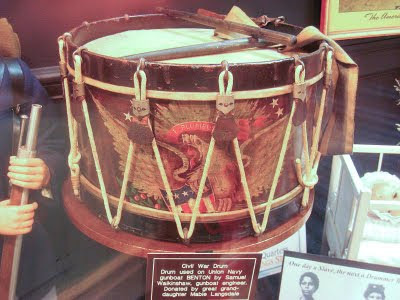 Drum from the American Civil War, exhibited in the Soldiers and Sailors National Military Museum and Memorial, Pittsburgh, Pennsylvania. Civil War Drum used on Union Navy gunboat Benton by Samuel Walkinshaw, gunboat engineer. Donated by great grand-daughter Mable Langsdale. Bert Bensinger talks about one of the Civil War-era drums he donated Thursday to the Historical Society of Schuylkill County. 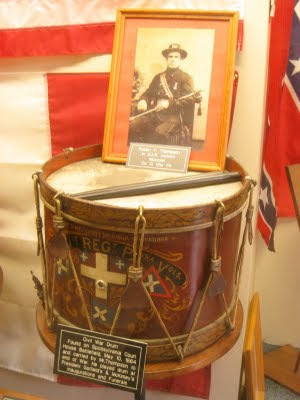 Charles H. May, Port Carbon, used the drums while serving in the war. When Charles H. May, Port Carbon, marched to the Battle of the Crater in Petersburg, Va., in July 1864, he was playing a drum with a shell made of brass. 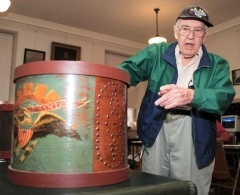 "This was a battle drum," Bert Bensinger, 83, a historian from Port Carbon, said as he donated the Civil War relic to the Historical Society of Schuylkill County in Pottsville on Thursday morning. 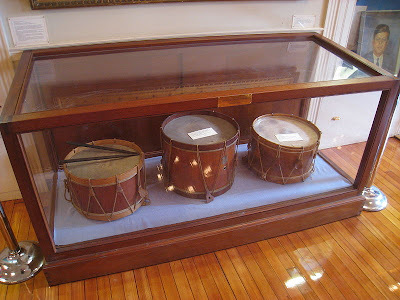 Bensinger gave the three drums May used while serving in the War Between the States. 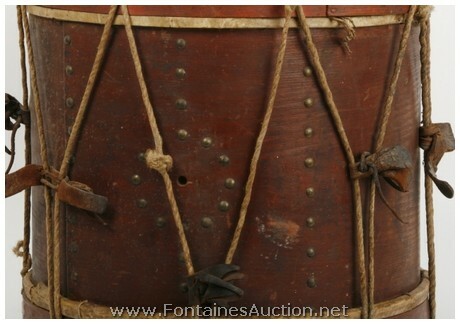 In addition to the battle drum, he also donated two drums with wooden shells, a practice drum and a parade drum. He also donated May's 38-inch saber. 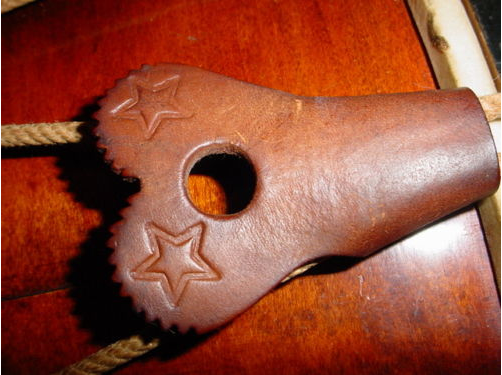 Made in 1863, it has a brass handle and a 28-inch steel blade. "In the Civil War, every musician carried a sword," Bensinger said. Bensinger also donated a photo of May taken at the 50th Gettysburg reunion in 1913. 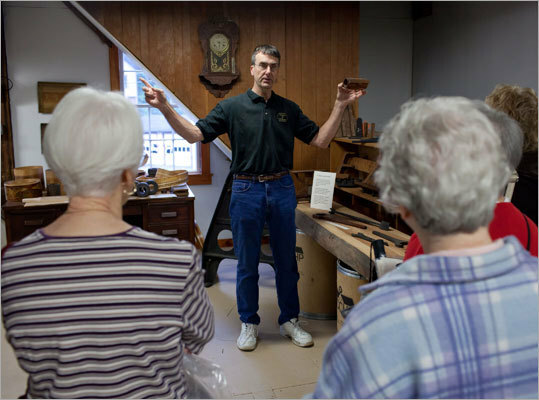 Society President David Derbes said the items will be placed in the society's Civil War room, which opened in December 2006. Located on the second floor of the society headquarters at 305 N. Centre St., the display contains more than 600 artifacts and photographs. Born in Port Carbon, Feb. 16, 1845, May served as a drummer in the 31st Regiment at the opening of the war and later in Company C in the 129th Regiment and Company G in the 48th Regiment until the end of the war, according to his obituary, published in The Daily Republican. He was involved in the digging of the mine that led to the Battle of the Crater, Bensinger said. During the following winter, while the opposing armies faced each other over the trenches around Petersburg, the Union musician suffered a shoulder injury when a 64-pound mortar shell exploded on top of a bomb shelter he was in, according to Bensinger. After the war, May returned to Port Carbon and worked as a machinist. He died Nov. 10, 1920, at his residence at 116 Pottsville St. and was buried in Lutheran Cemetery in Port Carbon, according to his obituary. Bensinger said he acquired the items "around 1950" from May's brother, Fred. "He was born 20 years after Charlie," Bensinger said. At the time, Bensinger was a plumber, the borough fire chief and the local historian. Fred May asked Bensinger to investigate an odor. 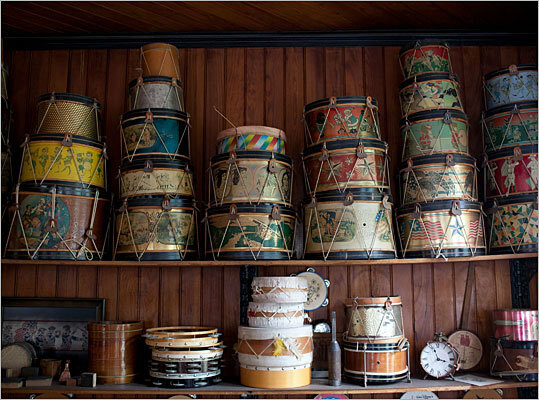 When Bensinger opened a tiny closet on the third floor, he said he spotted the drums. "What are these?" Bensinger asked. "They're Charlie's drums," Fred May said. "No kidding. Do you want them?" Bensinger asked. Fred didn't and gave them to Bensinger. "I took them home and cleaned them up. In the beginning, I just used a damp cloth," Bensinger said. 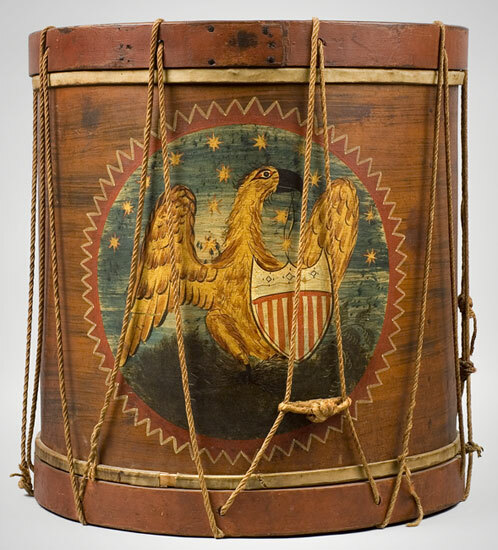 When he wiped off the dust on the parade drum, his said he was very surprised to see the Union eagle painted on the side. Over time, the drum heads deteriorated and Bensinger said he had to replace them. 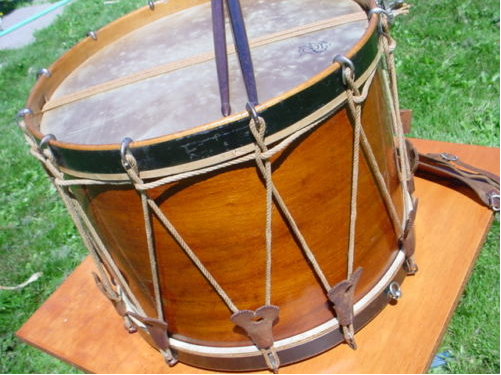 While the wooden rim on the battle drum is original, he said he replaced the rims on the parade and practice drums. The American Civil War, the conflict between the Union Government and 11 Southern Confederate slave states, lasted from 1861 and 1865, killing more than 600,000 people. According to the U.S. Department of Defense, the Union suffered 364,511 military deaths and the Confederacy 133,821. About 10,000 county soldiers served in the Civil War and about 800 died in the fight, according to Peter Yasenchak, the historical society's executive director. "In the Civil War, Port Carbon had 513 enlistments with only a population of 2,000," Bensinger said. In addition to several drums, Bensinger donated a saber and photograph taken at the 50th Gettysburg reunion in 1913. May, the soldier who owned the items, is front, second right, in the photo. 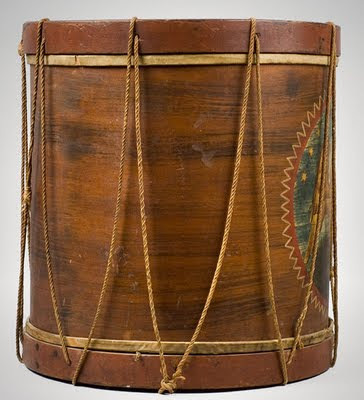 1st Minnesota Civil War drum, 1861. The 1st Minnesota Volunteer Infantry Regiment was the first unit from any state pledged to fight for the Union. As part of the Army of the Potomac, the 1st took part in many significant battles and campaigns including Bull Run, the Peninsula Campaign, Antietam, and Gettysburg.The Battle of Gettysburg was the 1st Minnesota’s finest hour, where it made a heroic charge that helped secure the Union victory. The regiment suffered heavy losses as a result. Featured on the Minnesota Historical Society's Collections Up Close blog. 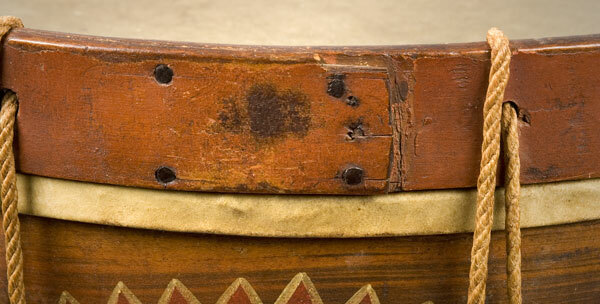 The maker's name, city and state is printed on the artwork toward the bottom of the drum. 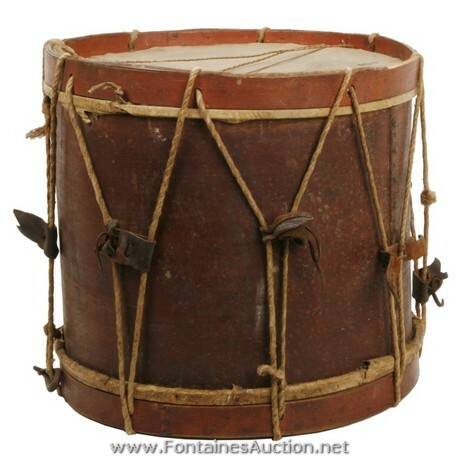 It's a Tompkins drum. In 1854, in the rural town of Granville Massachusetts, Silas Noble and James P Cooley set about the business of making toy drums. The company flourished and in a short time they were making thousands of drums a year. 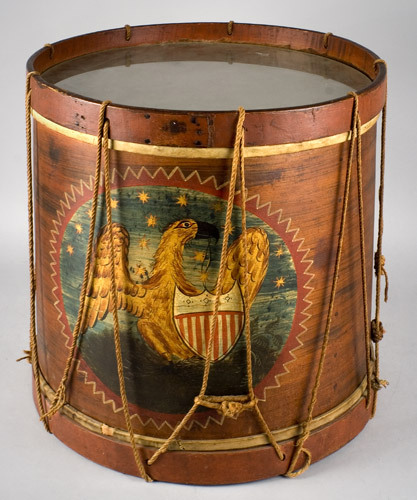 The call to war in 1861 shifted the production from toy drums to military snare and bass drums. 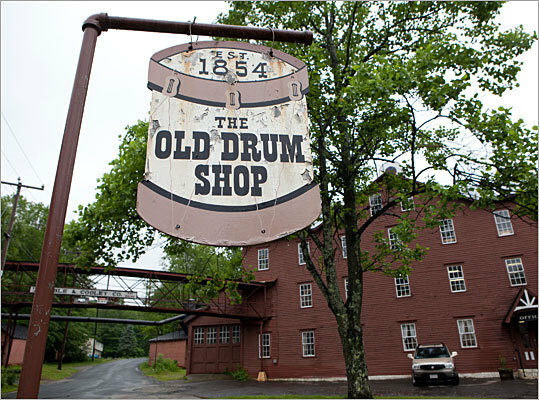 One hundred and fifty seven years later, the descendants of James Cooley are still in the business of making drums at Noble & Cooley Company in Granville. From millions of toy drums to production of high end steam-bent snare drums and custom drumsets, this little company has continued to make drums since 1854. A few years ago the company decided to turn some of its factory space into a museum with a focus on “Yankee Ingenuity” and industrialism in rural New England. While gathering and assembling artifacts, they were approached by a Civil War memorabilia broker who was in possession of a drum made by the company and picked up off the battlefield at Gettysburg. 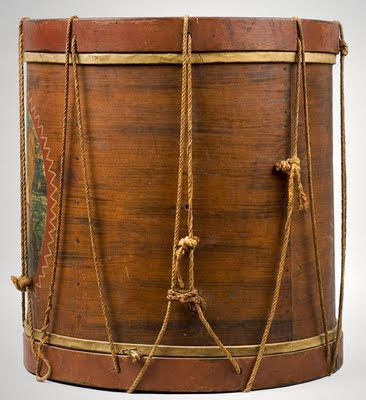 The museum reached out to the community for support and was able to bring the drum home to Granville where it is prominently displayed along with its provenance. This spurred interest in the role Noble & Cooley and the town of Granville played in the war efforts and also caused the owners and family to dig further into the archives. Jigs and tooling were found. 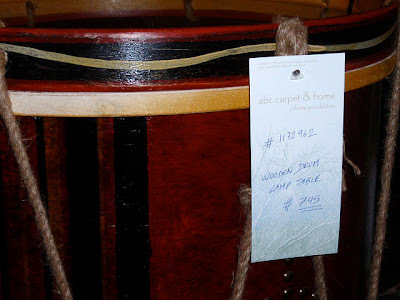 A local logger was called in to identify the wood on the returned drum. Family diaries were read and re-read. 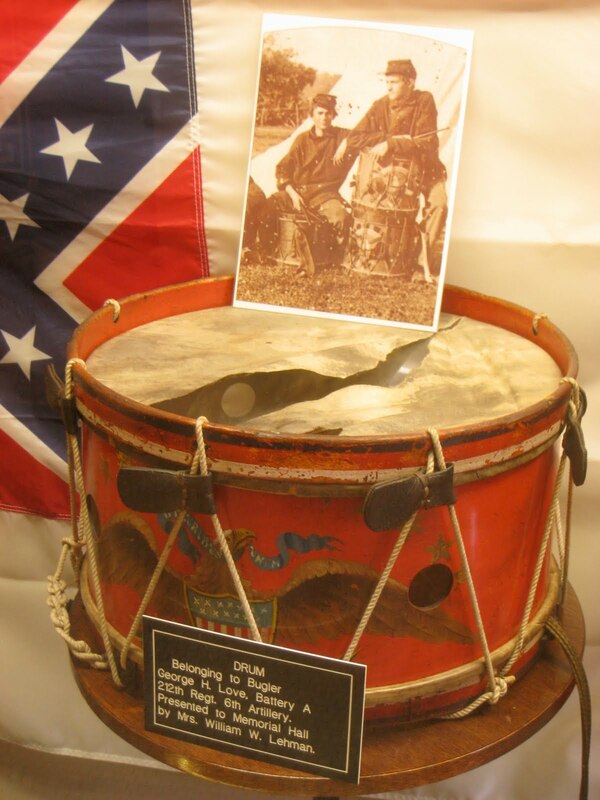 And the decision was made that six generations later, the Noble & Cooley Drum Company would once again make a contract Civil War Drum to commemorate the Sesquicentennial in 2011. 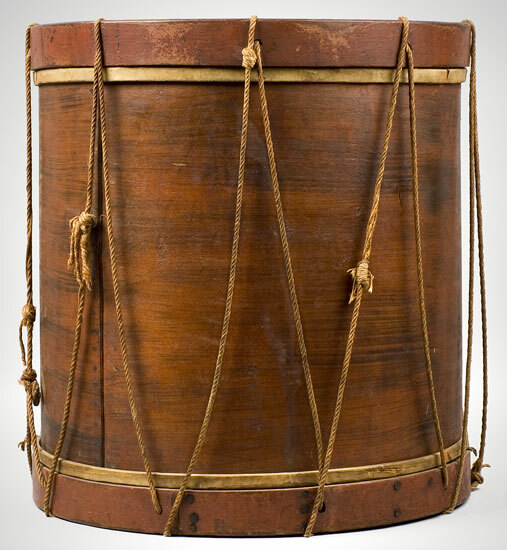 The “contract drum” was the standard issue drum ordered for the Union Army. 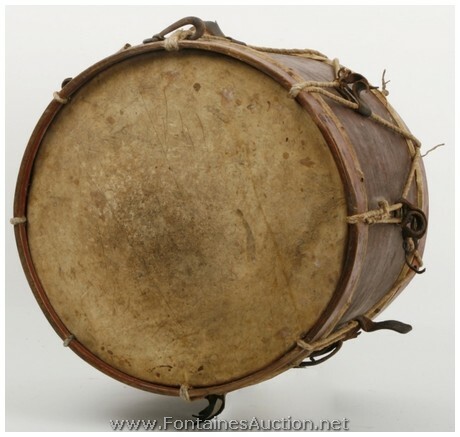 It was a single ply, steam-bent shell of either tulip wood or ash with oak hoops and calfskin heads. 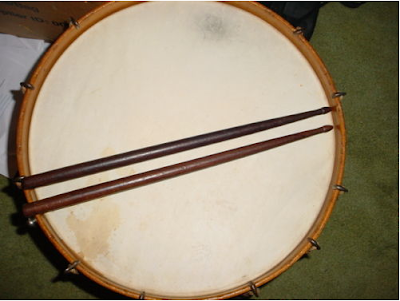 The reissue drum is 12” deep and 16” in diameter. The shell is of tulip wood from trees cut within a few miles of the factory. 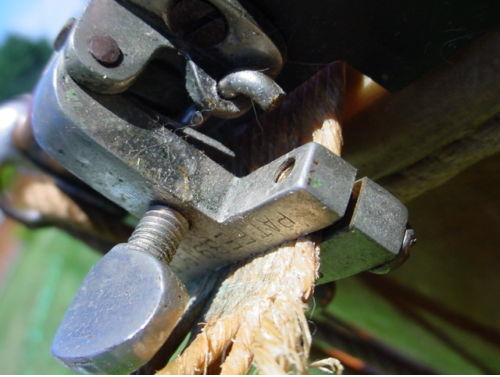 The wood is steam bent using the same steam chest and methods used 150 years ago. Noble & Cooley plans to produce a limited number of this commemorative drum from 2011-2014. The drums will be sequentially numbered and will be shipped with a “certificate of authenticity” which will include a brief history of the company and the specifics of the drum. Note: This story from the Boston Globe's website and hard copy paper. See also "Noble & Cooley To Re-Issue Civil War Drums to Commemorate War's 150th Anniversary in 2011," this blog, Sep. 1, 2010. 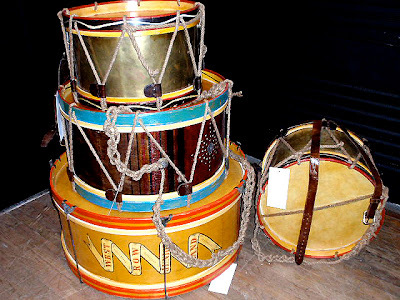 GRANVILLE — They are still managing to keep time at Noble & Cooley, a Civil War-era drum company in Western Massachusetts. 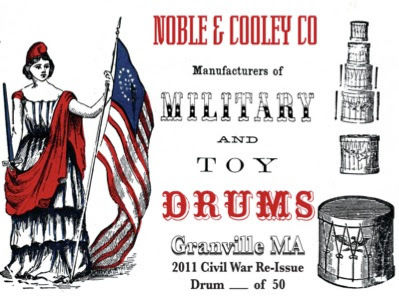 After decades as one of the country’s biggest suppliers of toy drums, Noble & Cooley in the 1980s branched out to make state-of-the-art drum kits, with customers that included Phil Collins and Paul McCartney. But the bleak holiday shopping season that followed the Sept. 11, 2001, terrorist attacks nearly led to the company’s demise. As during other trying times in its history, Noble & Cooley somehow persevered, even as it got smaller. 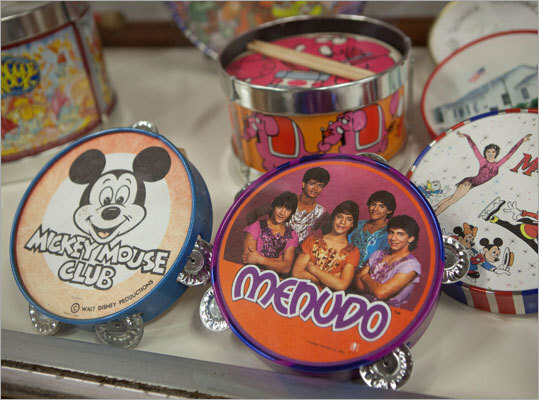 Today, the company is trying to remain relevant by capitalizing on its rich heritage. 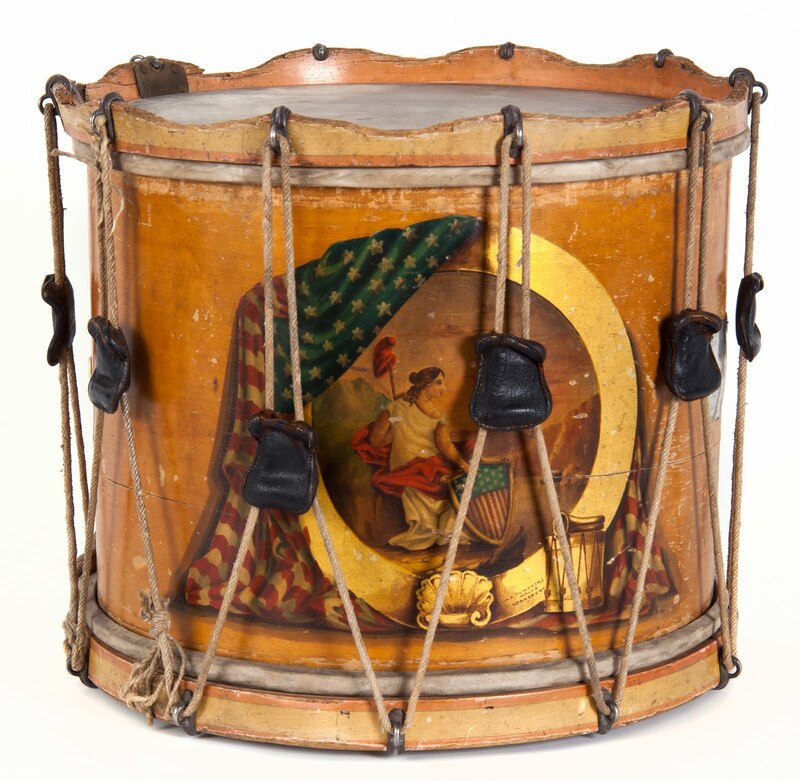 To commemorate the 150th anniversary of the start of the Civil War, Noble & Cooley is producing replicas of the snare drums Union soldiers used to communicate on the battlefield. It is also one of 100 finalists in the This Place Matters grant challenge, sponsored by the National Trust for Historic Preservation. Online voting closes tomorrow, with the top vote-getter receiving $25,000. “We’re doing everything we can to hang on,’’ said Jay Jones, the company president. 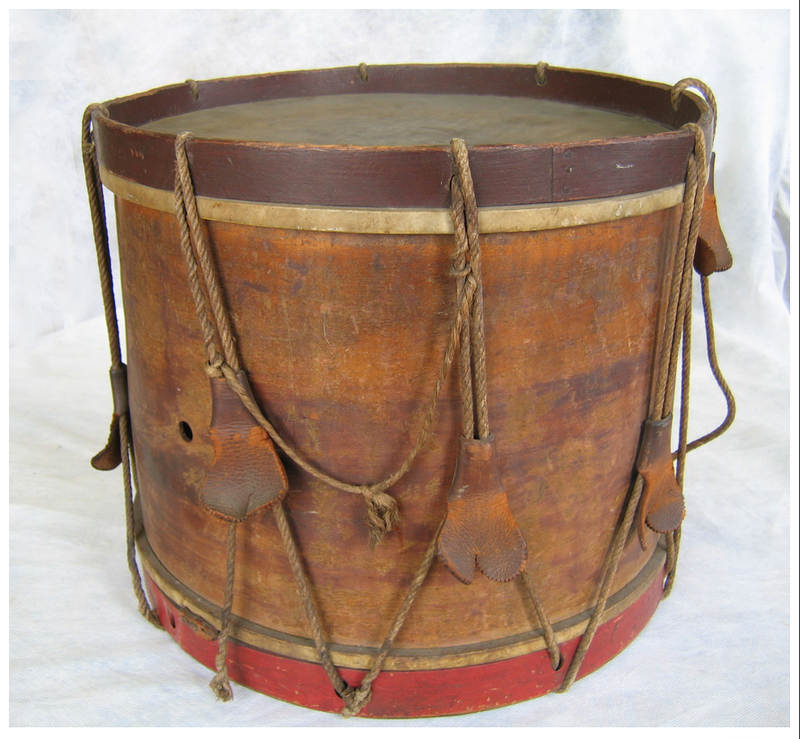 He is a sixth-generation descendant of cofounder James P. Cooley, who began making drums in Silas Noble’s kitchen in 1854. Once a holiday season powerhouse, with a peak of 120 employees two decades ago, Noble & Cooley is now a true mom-and-pop shop. There are just three full-time workers: Jones; his wife, Carol; and their 27-year-old son, Nick. When he first joined his father in the family business, Jones, 57, shifted some of the emphasis away from the toys that had been a staple for years. 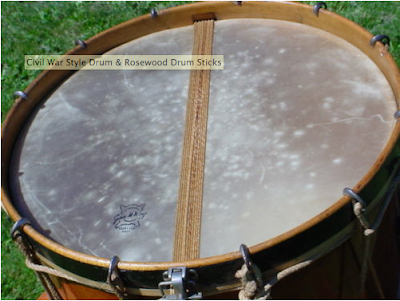 Thanks to the rich tone of its natural wood drums (most contemporary drums, including some of Noble & Cooley’s, are plywood), the company quickly attracted a loyal customer base among some of the world’s top musicians. Collins once appeared in an endorsement advertisement alongside an image of Abe Lincoln. 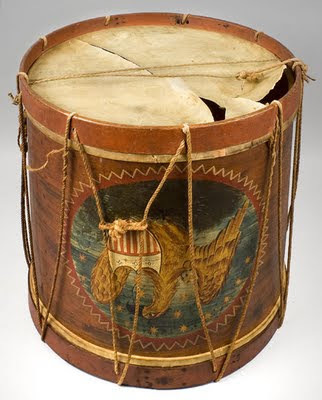 Noble & Cooley’s cofounders made a presidential campaign drum for Lincoln in 1860, using wood that he had chopped years before. Jonathan Mover, an acclaimed drummer and the editor in chief of Drumhead magazine, found out about Noble & Cooley drums from musician Chris Whitten, who used to play with McCartney. 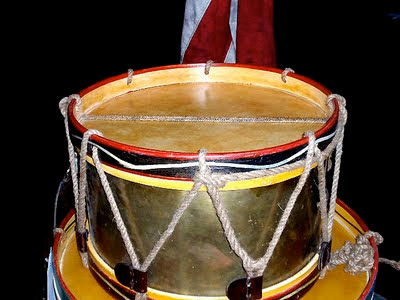 Mover bought two limited-edition snares years ago. 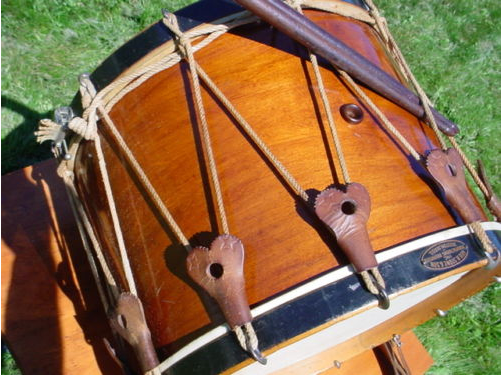 Mover credits Noble & Cooley’s commitment to quality as an inspiration for larger drum companies, such as Yamaha, Pearl, and Tama. “All the big companies are making very high-end gear, which they really didn’t do years ago,’’ he said. Unfortunately, Mover said, that has created considerable competition for a small, family business such as Noble & Cooley. The company still builds several dozen custom drum kits (some of which sell for up to $10,000) and as many as 500 solid-wood snares each year. Although it’s not the first time the drum company has faced adversity. Few episodes, however, were as devastating as the economic plunge that followed Sept. 11, 2001. That downturn effectively wrecked the company’s toy business, which had reached a peak of $3 million in annual sales in the late 1970s. Noble & Cooley was left holding two dozen containers of unsold toy instruments imported from China when some of its biggest clients, including Sears and JC Penney, canceled holiday orders. “The bank started running scared,’’ said Jones. “They called in the note. It took me six years to pay off’’ the bank. To do so, he had to sell off hundreds of acres of family property in this rolling farmland west of Springfield. The Noble & Cooley compound — three big old buildings with tilting floors, connected on the upper levels by iron pedestrian bridges — is a much quieter place today than it was at the height of toy production. In fact, one building isn’t even used. Walking around the factory on a recent Friday, Jones was called away to help unload machine parts from a delivery truck. As a light drizzle fell outside the loading dock, the driver looked around the barn-like warehouse, which was mostly empty. “I totally forgot this place was here,’’ he said. A cardboard pallet box sat off to one side, full of tin tambourines featuring characters from Jim Henson’s old “Fraggle Rock’’ series. Their plastic sleeves had long since grown moldy. Nick Jones helped his father empty the truck. He plays bass in a metal band with his older brother, Jonathan. Jonathan, a graphic designer with waist-length dreadlocks, is the real drummer in the family, said Jay Jones. “I play the radio,’’ he joked. When they were kids, Nick and Jonathan had the run of the place. Now, the boy who once terrorized seasonal employees actually does have the run of the place. 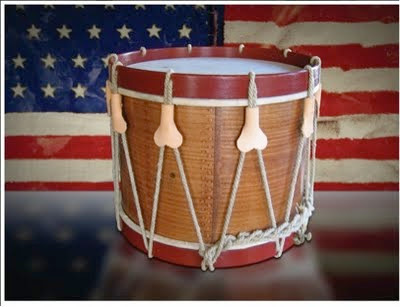 Reduced to such a tiny operation, these days it takes the company eight to 10 weeks to fill a custom drum order. The process to make a Civil War replica snare — steaming, bending, aging, and curing — requires 16 weeks. Jay Jones and his son assemble each reproduction drum, made of steam-bent tulipwood, using the same heavy, belt-driven machinery that employees operated more than a century ago. Noble & Cooley took one of the drums, which are numbered, to the most recent Gettysburg Remembrance Day event last fall. “People were throwing credit cards at us to get a low serial number,’’ said Jones. Having retrenched, the family knows that the value of its product is directly related to the time and care they put into it. Jones, smiling, credited a friend with his new philosophy. “There’s no such thing as a drum emergency,’’ he said. This year marks the 150th anniversary of the Civil War. 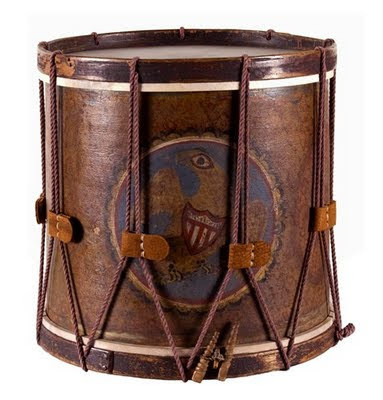 To commemorate the occasion, Noble & Cooley, a drum company in Granville, will be producing replicas of the snare drums that Union soldiers played on the battlefield as a form of communication. The small, family-owned company goes back even further than this moment in history, back to 1854, and is still pounding away at business. Click through the slides to see a behind-the-scenes look at the factory and a peek into its history. 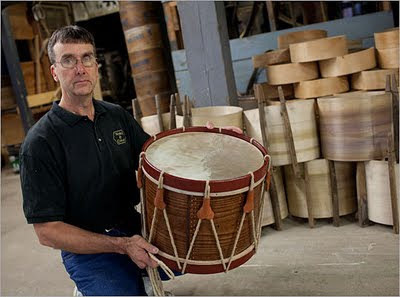 Jay Jones, 57, pictured here, is the president of Noble & Cooley and a sixth generation drum maker, a direct descendant of the company's founder, James P. Cooley. 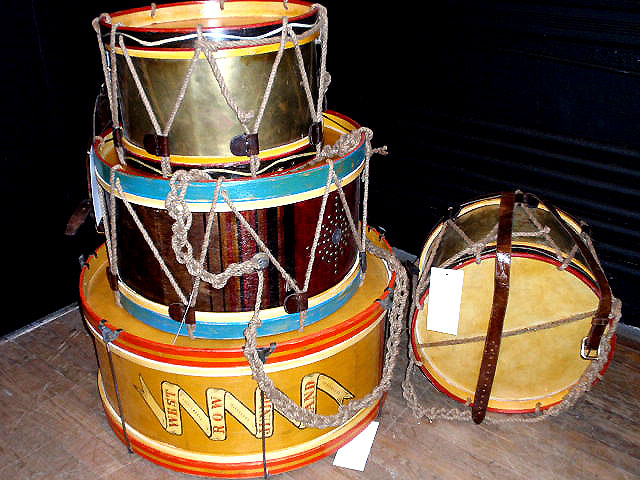 Despite struggling through fires, the Great Depression, World War II, and the holiday season following 9/11, all of which have put the company at risk, it still continues to make drums of all kinds, such as replicated snare drums, and even at one point made drum kits for some of the world's top musicians. The company turned to making state-of-the-art drum kits in the 1980s. Capitalizing on the rich tone of natural wood drums, the company quickly attracted a loyal customer base that included Phil Collins and Paul McCartney. Jonathan Mover, an acclaimed drummer and the editor-in-chief of Drumhead magazine, credits Noble & Cooley’s commitment to quality as an inspiration for the larger drum companies, such as Yamaha, Pearl and Tama. “They’re absolutely two of the finest snares I have,” said Mover. The company peaked in the late 1970s with a top annual revenue of $3 million. At one point, it had 120 seasonal employees. However, there was a downturn after Noble & Cooley was left holding two dozen containers of unsold toy instruments imported from China when some of its biggest retailers essentially canceled Christmas following the 9/11 attack. “The bank started running scared,” says Jones. He had to sell off hundreds of acres of family property to pay back the banks. Pictured: old products on display in the museum. 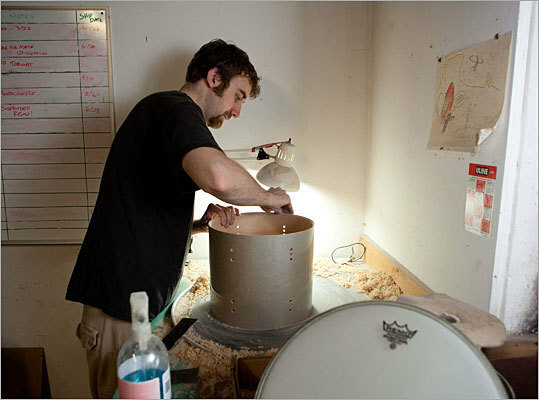 All of the drums are handmade, crafted by one of the company's three employees: Jones, his wife Carol, and their son Nick Jones, 27. They make use of heavy, belt-driven machinery, much of which was in use over a century ago. 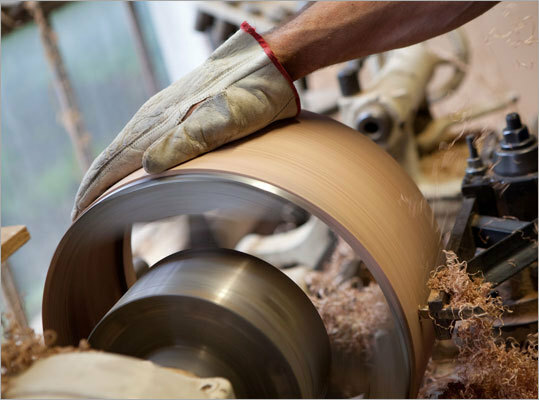 Each drum is made of steam-bent tulipwood. 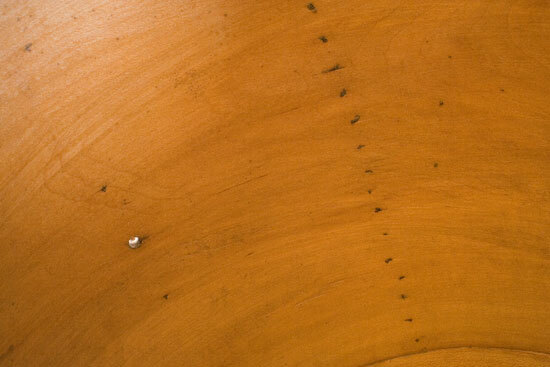 Here, a red oak shell for a snare drum is lathed. In addition to filling orders, the company also doubles as a museum. The Society of Industrial Archeology visited the old factory, took a look at the old machinery, and recommended preservation. Now Noble & Cooley is one of 100 finalists in a grant challenge sponsored by the National Trust for Historic Preservation called This Place Matters. Online voting closes on June 30. The top vote-getter will receive $25,000. Here, Nick Jones sands a red oak shell for a drum. He is a musician too. He plays the bass in a band with older brother Jonathan, who is the real family drummer. - A presidential campaign drum in 1860 for Abraham Lincoln, using wood Lincoln had chopped years before. - Giftware in the '60s and early '70s that included waste baskets, ice buckets, lamps and cutting boards. - State-of-the-art custom drum kits for Phil Collins and a drummer for Paul McCartney's band. - Replicas of the snare drums used by Union Soldiers on Civil War battlefields to convey messages. Founders Silas Noble and James P. Cooley. Jay Jones, a descendant of Cooley, his wife Carol, and son Nicholas.